The World’s End is probably the best End of the World film…really. I love everything Edgar Wright does. I’d pay to watch him eat breakfast. From his UK series with Simon Pegg and Nick Frost, “Spaced”, to the amazing “Shaun of the Dead”, to the lessor but still better than most “Hot Fuzz”, to the brilliant “Scott Pilgrim Vs. The World”. He was a writer on the underrated “Adventures of Tin Tin”. He directed the best mock trailer in Grindhouse, “Don’t” And he was an Executive Producer on “Attack the Block”, which if you haven’t seen, you should. It’s not a long pedigree, but it’s nearly flawless. And so you can understand my anticipation for “The World’s End”, and the utter joy when it lived up to my expectations. The story, in a nutshell, it about high-school cool guy Gary King (Simon Pegg) never letting go of those school days when he was cool, and then gets all of his school buddies together to relive those days in the town that they grew up in, but that which his buddies left when they matured, had families, and essentially became adults. King convinces them to return to the town for a final go at “The Golden Mile”, which is a twelve tavern pub crawl, where they drink a pint of beer at each establishment. But, when they get back to the town, nothing is how they left it — and it’s not only the Starbucksization of the pubs making them look exactly the same as one another. The premise is simple and absolutely absurd. However, when you dig through the comedy, fight sequences, and robots, the theme is universal — Being fun, irresponsible, and unaccountable is all well and good — but it comes at a price. And this is what makes for good filmmaking. As much as I love Wright’s filmmaking style, I love more the fact that he is able to humanize the characters in a way that we can relate to them, no matter how ridiculous they are and no matter how unbelievable the circumstances may become. It’s a difficult balance, and most filmmakers fail to walk that tightrope successfully. 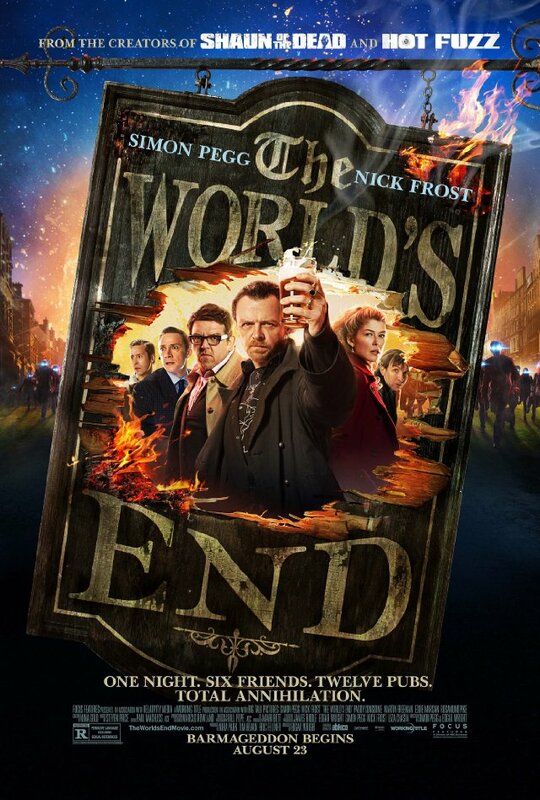 Furthermore, as far as “drinking” movie go, The World’s End, does something that I don’t think I’ve really noticed in other films: It keeps our characters drunk, and getting drunker. The idea that these guys are going to go through 12 pints of beer in an evening is an astounding feat on its own. But less intelligent films about characters drinking themselves into oblivion (Leaving Las Vegas not withstanding), usually conveniently forget that they’ve been drinking for the first two acts of the film so they can accomplish their Act 3 triumph. Not this. Our heroes face their fears completely sloshed, with Pegg’s Gary King nearly devoid of articulation near the end of the film. It’s a small detail, but it shows the attention that Wright and Pegg give the screenplay. As a critique? Perhaps the fight sequences are a bit too choreographed, too long and somewhat repetitive. At a couple of points, I was thinking “Let’s move on already.” But most of the time Wright mixes it up enough to keep it interesting. Switching arms out for legs — which is surprisingly disturbing. Andy (Nick Frost) donning bar stools as boxing gloves. And Peter (Eddie Marsan) gaining vindication on a class bully with a tree branch. And through all of it, you are kept laughing. If you are also an Edgar Wright/Simon Pegg/Nick Frost fan, go and see this…in the theater…with a crowd of other fans. The laughter is contagious — and who knows, you may find an audience with people who aren’t drunk enough to have a conversation with the characters on the screen. I had this unfortunate experience, and I STILL was able to enjoy the film.